I must make a confession up front: I would never have watched The Ghost Whisperer if it was not for my involvement with the Virtual Worlds Research Project at Roskilde Unviersity. I’m most certainly not a Jennifer Love Hewitt fan, and the idea of the series never captured me. Especially since it was on Friday nights, and that was usually my veg out with movies night, my one night off of the work of being a graduate student. So you can imagine my surprise when I heard that an episode of a show about a woman who talks to ghosts was to feature a virtual world. Now, I know various other television shows, movies, books, and so forth have in some way featured stories about virtual worlds. At the project in Roskilde, we even compiled a list of all known pop cultural representations of virtual worlds. But in a series about ghosts? Before seeing the show, I thought it would concern the idea of “ghost in the machine”, a term that reflects philosophical considerations on consciousness and has in computer studies come to refer to a conceptualization of “artificial intelligence”. And, indeed, the episode featured a ghost in the machine — literally, or as literal as a fiction can get. In the episode, a ghost haunts a virtual world to enact revenge on its killer. 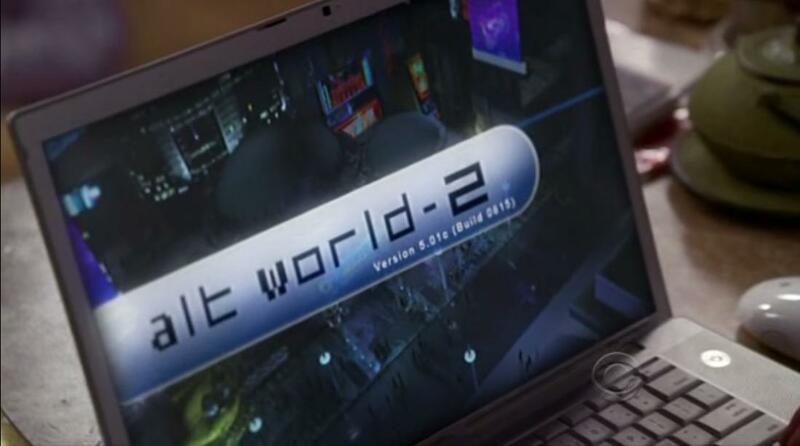 For this episode, the series created their own virtual world — or at least a computer generation simulating a typical social virtual world, such as Second Life. “Alt world – 2” is a dark, neon-filled, landscape of bars, goth-style clothing, and violence: a representation of a virtual world that may come easily to mind to a general public that is not well acquainted with the range of worlds that exist. The world is futuristic in appearance, and allows people to explore their alternate identities — both characteristics are common in the public discourse about what are these media products. This representation is the first indicator of how virtual worlds in general would be discursively cast in this episode. The story follows a standard theme of encouraging wariness about this new technology and the people who engage with it. Indeed, in looking at a number of pop cultural representations of virtual worlds, especially in film, the common theme in representation is to consider the technology more as a potential harm to humanity than a benefit. While this is not always the case, there does appear to be a trend, especially when the media product is intended for a larger audience than those who are most likely to already be engaging with the worlds, the gamers. But, then again, even in media products directed to gamers, or science fiction and fantasy fans in general, there will sometimes still be indications of thematic concern over the role of these technologies in our lives. Consider the webseries The Guild, which propagates the conceptualization of gamers as socially inept or awkward. Or the television series Star Trek: The Next Generation, which introduced the idea of a “holodeck” (which, incidentally, has inspired computer scientists now to actually create the technology due to advances in holography) — even in that series, generally positive towards technology, had episodes in which the holodeck threatened the safety of the Enterprise. Why all this fear about virtual worlds? Well, first, it appears to stem from a fear of losing oneself to a computer. The fears appear to go back to the introduction of the computer in modern society, igniting discussions in culture about how the computer would usurp humanity’s position in dominance on the planet. Such is the fear of robot revolutions and computer overlords subjugating humans. Virtual reality, the technological precursor to today’s virtual worlds, plugs into this same fear: a plugged in person, who’s senses and perceptions are commandeered by computer generated stimuli, is feared to be a person who will lose him/herself in the computer generated virtual world, unable to discern between “the real”, or the physical, and the virtual. When a person can no longer tell the real from the virtual, then, the argument would go, the computer has taken over control of how the person knows reality. And once the computer has that control, the computer (or whomever controls the computer) can dictate how the person will think, feel, and act. Second, more particular to virtual worlds, there is the fear that stems from engaging with other media products, and more specifically television and video games. This is the fear of addiction: of spending too much time and money on a virtual experience that is considered to be superficial in comparison to other experiences, such as being with physical people in a physical space doing physical activities (ex. sports). The fear of addiction has been consistently reified by journalistic stories on how people would play with a virtual world for days on end, without eating, without moving from their computer. Virtual worlds have even had their names discursively changed to reflect this fear (ex. EverQuest becomes EverCrack). Third, there is the fear that stems from the Internet itself, and the fear of cyber-predators. One of the long-standing concerns with the Internet is the anonymity it provides people — anonymity that can be used to experiment with one’s identity, for good or for ill. For ill would include individuals who, in going online, act as if they are someone they are not in the physical world, potentially to entrap children into situations those children should not be in — such as engaging in sexual discussions and acts, online and offline. This fear, naturally, has become of a larger concern with parents: but as many of the game virtual worlds target children and teenagers, it is a concern they take seriously. Fourth, there is just the general fear of new technologies that happens cyclically in human history. It seems that every time a new technology is introduced into the a society and culture, it undergoes a period of flux within which the society/culture attempts to understand what role the technology will play, for good or for ill. As this flux is occurring, there are many tensions that are discursively played out in the news and popular culture as the people try to make sense of what this “thing” is. And those early adopters, who are engaging with the technology during this period, are scrutinized for why they are doing so, what doing so is doing to them, and so forth. These early adopters are the testing ground for how the rest of society/culture will engage with the technology. And those who fear the technology for how it could change the traditions they are accustomed to may shift this fear and see the early adopters as their objects of worry. These are four theories — perhaps not the only ones, and most likely interconnected with one another. They do appear to all inform the typical outcome of making sense of new technologies: that the only way to overcome the fear is for the technology to become ubiquitous in people’s everyday lives. Virtual worlds have not yet reached that point; but perhaps the rise of social games on Facebook and as mobile apps will help with this acceptance. Only time will tell. And it will probably tell us first in how the representation of virtual worlds changes in pop culture.